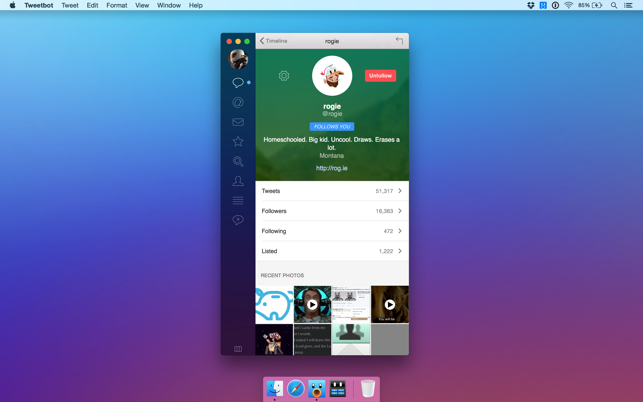 Legacy version, please upgrade to Tweetbot 3 for Mac instead. 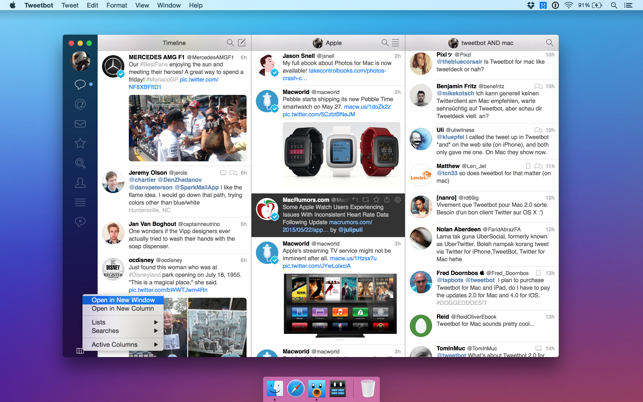 Tweetbot is a full-featured OS X Twitter client with a lot of personality. Whether it’s the meticulously-crafted interface, sounds and animation, or features like multiple timelines and column views, there’s a lot to love about Tweetbot. Multiple Timelines. Quickly switch between your lists as your main timeline. Multiple Windows and Columns. Display timelines from different accounts side by side. Mute filters lets you block messages from users without unfollowing them. You can also mute hashtags and specific keywords. 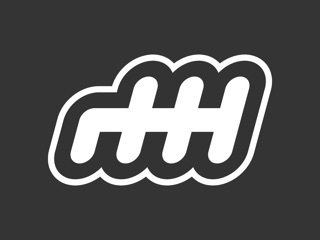 On August 16th Twitter will disable parts of their public interface that we use in Tweetbot. Because Twitter has chosen not to provide alternatives to these interfaces we have been forced to disable or degrade certain features. We're sorry about this, but unfortunately this is totally out of our control. - Timeline streaming is now disabled. Your timelines will now refresh automatically every 1-2 minutes instead. - Notifications for Mentions, Direct Messages, Follows and Follower's Tweets will now be delayed by a few minutes. - Notifications for Likes and Retweets have been disabled. - Activity tab has been removed. I love Tweetbot! There’s just a few things that I would enjoy having. With videos, theres no way of seeing your progress in the video. Also, the menu bar is very inconsistent with whether or not it wants to show up. Also, when it comes to the activity section, I find it kind of weird on how when I press one of the activity items, it opens the person who liked/retweeted/mentioned’s account, and doesn’t show the tweet. Also, when I want to see who liked the tweet, it shows Favstar, and not who actually liked the tweet. I wish there was a way to turn that off, that would be fantastic. It’s doable without, but those features would be god-sent if they existed. Great app, I’ve bought it twice on iPhone and now on my Mac. Just a tiny bit more until it’s engraved in greatness. Great update - thank you! I use Twitter all day long, and gave up on all the free apps on my iPhone and iPad when I started using TweetBot there. I'm happy not to have ads, even happier to have my timeline be unmolested (no “recommended” nonsense, no out-of-order tweets), but I'm even happier knowing that the company's revenues - and therefore their priorities - are built around my purchase of the app. They're not focused on getting people to see ads; they're focused around making their customers so happy they tell other people how great their apps are. 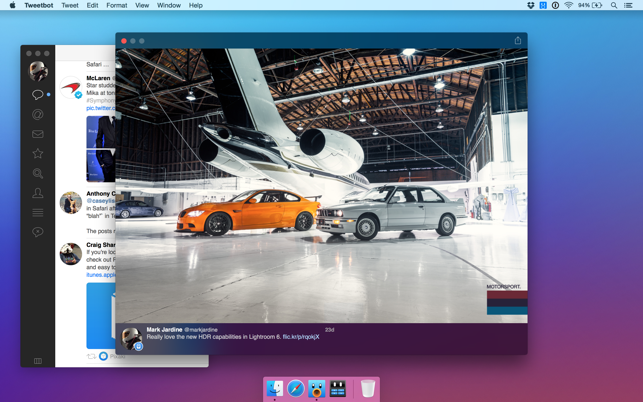 BUT.. given that today is still 2017, I think Tweetbot has been for a while and still is, hands down, the best macOS Twitter app in the Mac store. Not bad, but where’s the dark/night mode?????? 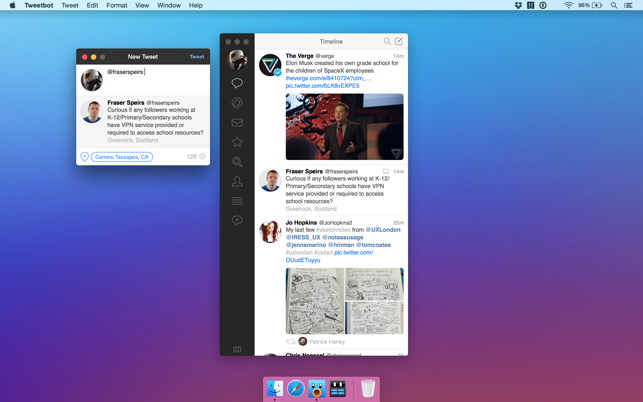 I know I’m probably in the minority, but I was personally happy with the Twitter app for macOS. But when it was recently retired, I was forced to look elsewhere for my needs. Twitteriffic was okay, and had nice features, but lacked one significant thing I like to have: the ability to edit who I follow and see who’s following me. Not necessarily important to others, but it’s what I want. One would think, however, that there would at least be some kind of theme changer from light to dark mode, but no. This is disappointing, as it should have been a given, preferably a setting that allows changes to occur automatically as the day changes from sundown to sunset. Do that, and a lot of us will be happy.